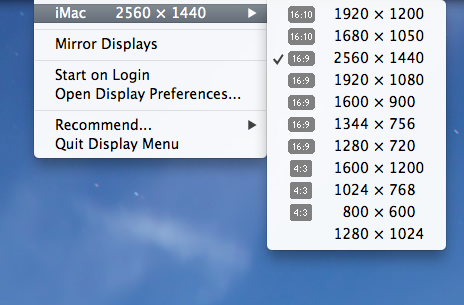 Recently I bemoaned the ponderous way in which Mountain Lion switches screen resolutions. I often shoot screencasts in less than optimal resolution and the multiple clicks and keypresses required are vexing. David Kreindel heard my call and answered. David pointed me to this Display Menu, a handy app that brings back some old functionality. Does this look familiar. If that isn't enough, David also put together a simple AppleScript to speed up the process. Copy the below into AppleScript editor and go nuts. Thanks David. click radio button "Display" of tab group 1 of window 1 of process "System Preferences"
click radio button "Scaled" of tab group 1 of window 1 of process "System Preferences"
select row 9 of table 1 of scroll area 1 of tab group 1 of window 1 of process "System Preferences"